The newest game is here! After surviving many rollercoaster accidents, you have earned quite a fame all over the world. Now all the owner of rollercoaster ride wants you try out their rollercoaster before they can launch it to the public, but you only prefer to ride the most death defying and thrilling ride only. Such an owner asks you to test their ride before they can release and without a doubt as soon the rollercoaster starts the tracks starts collapsing. 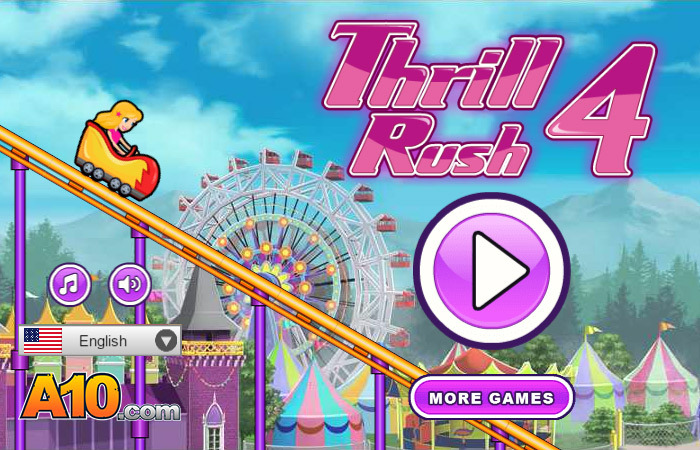 Get ready for another wild and exciting ride of your life in Thrill Rush 4. The game has become much more enjoyable and thrilling than ever before. With new stages and lots of exciting obstacles will definitely be worth of your time. Like the previous sequel this game is really addictive and fun to play. 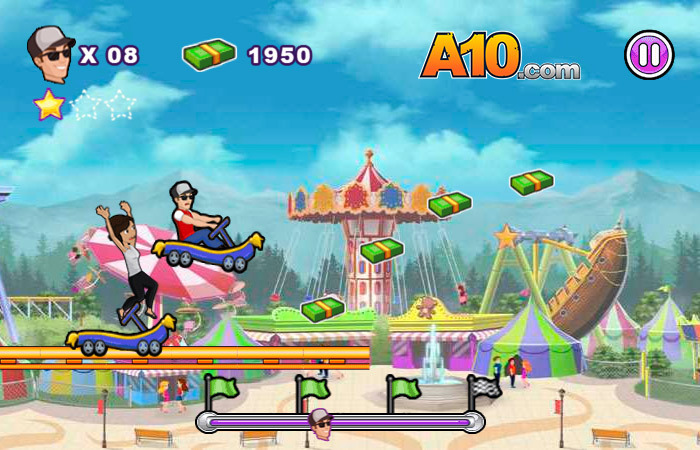 Every new stage will give you the thrill of riding a real rollercoaster. 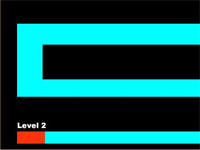 The visualization of each stage are beautifully crafted with lots of difficult obstacle to tackle your way ahead. 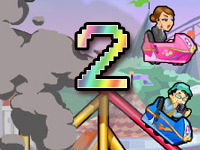 In this game you can make your cart accelerate and maneuver atthe speed of your choice. 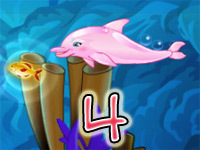 Many new and old feature has been added and replaced so the game is really attractive and electrifying to play. 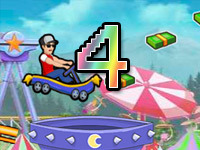 In Thrill Rush 4 the obstacles are really dangerous than ever before so players will have to be really cautious and precise in order to survive the journey. The new obstacles are quite tricky for example the flame thrower – you face this fire breathing pipe at the middle of the journey due to the accidental gas pipe leakage which are causing fire to hurl out from the pipe. The flame thrower can be quite deadly so try to avoid at all cost. Another one of the obstacle is damaged tracks. When the accident occurred some of the tracks got badly damaged and the cart can no longer run on them, if your cart steps on these damaged tracks your cart will lose the balance and make a fall, so try to avoid these damaged tracks. The tracks are very easy to spot, it will be dented with spikes and nails scattered all over the place. 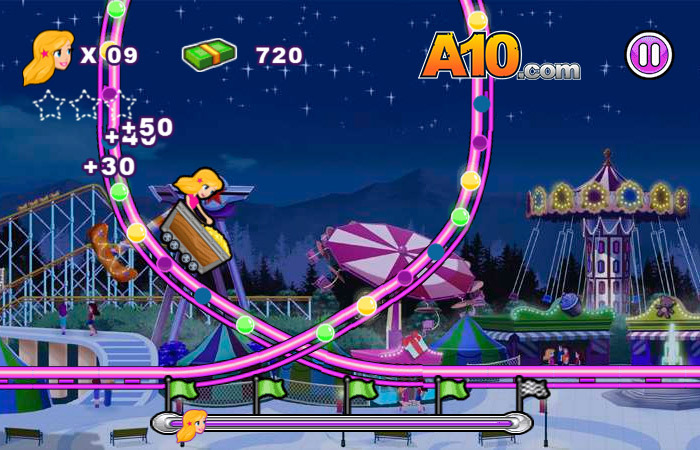 The Store remains similar to the previous parts of the game, to purchase an item you have to collect the cash lying around all over the rollercoaster tracks and the more you collect the greater the item you will be able to get. The store sells you lots new avatar to play around. Tired of the old look? Buy a new one and start having fun with it. Each of the avatar are really unique in model. There are plenty of cart designs available in the shop which are really attractive. You can select a total 100 model of cart from the shop each of them different from each other so purchasing them will definitely make your ride pleasurable along the way. 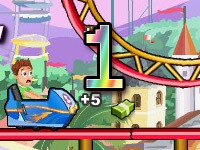 The score system remained quite the same like its previous franchise, your score increases with the collection of the cash that are lying around the tracks. The achievement is much more interesting, this time a lot of feature has been including the old ones. There are many secret achievements throughout the entire game. So start hunting for the achievement right away. This game is super fun ! If you liked it, make sure to check out the other games from the series. All of them can be found on our website. These games are free, so feel free to also share them with your friends !